Soft, steamed rice balls – the perfect foil for a spicy pork curry. Bring the water to a boil in a deep pan and add the thari and salt. Once the rice has begun to soften, lower the heat to medium and cook, stirring and scraping the bottom of the pan constantly. Cook the mixture to a firm dough (about 7 – 8 minutes) then remove from the heat and cover with a clean cloth to keep the steam in. 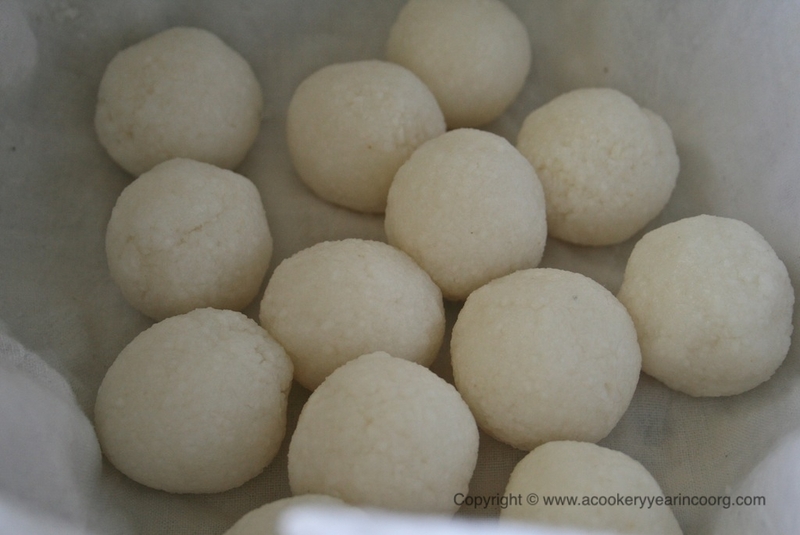 When the mixture has cooled enough to handle, form the dough into balls a little smaller than a golf ball (or smaller if you prefer) and arrange in a chekala* or steamer lined with cheesecloth. Keep a bowl of warm water with a few drops of ghee in it handy to moisten your palms when forming the kadambuttus. Steam on medium-high for approximately 20 minutes and remove from the heat. Allow to cool in the steamer. Makes approximately16 to 18 pieces. *A voluminous steamer, the chekala, or sekala, is an essential piece of equipment in a Coorg kitchen.A reasonable substitute is a large pressure cooker, used without the weight. A bamboo steamer will do as well, but the cooking may take a little longer.